Lighting-Gallery-net - Fluorescent - T-12 and larger/GE F40WW inside etchers - 1987 vintage! GE F40WW inside etchers - 1987 vintage! If you don't know the date code system and the number of punches in the end caps, they would be easily mistakened to be 1960s vintage! Sweet GE's. The inside etchers are the best. I still use these things. Don't look at date codes, just throw 'em in, they are a dime a dozen still fortunately. What plant was still using inside etch F40 in '87? Reminds me of the time I found a brand new inside etch F40/SW during the 90's along with the regular outside etch usually found at the time. This was in a big box store with a constant restocking too! Wish I'd saved it but I didn't realize how cool it really was at the time. The lamps above came from Bucyrus, Ohio. UPDATE: I lit them. They have the long electrode leads like current GEs and very little use. Awesome lamps! Warm white too. Superior score! My guess would be 1/77 as Bucyrus was still using inside etches. Could be their cheaper lamp as opposed to Mainlighter, their premium lamp. 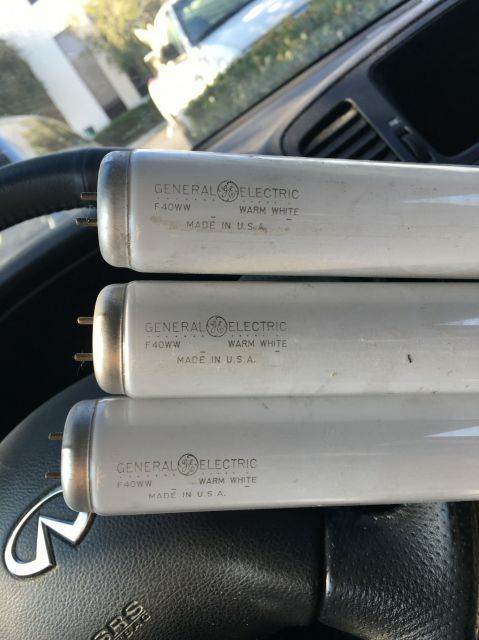 No, I found they got the newer, longer electrode leads, plus they got the 2 digit numbers stamped outside somewhere, neither were present in '77. When did the two-punch end caps start? What is the latest T8 you're aware of with inside etch? The 2 punch end caps came along in 1974. I know GE made inside etch F15T8s until at least the early 80s.